A Facebook cover image is the banner or masthead image across the top of a Facebook profile. On a personal profile, the Cover is always a photo, but a business page can have a video as its cover. The Facebook cover image space has an unusual extra-wide aspect ratio of 820:312. Users without the knowledge of how to edit photos or videos could end up with a Facebook cover that crops out key details. Go to the Kapwing Resizer. 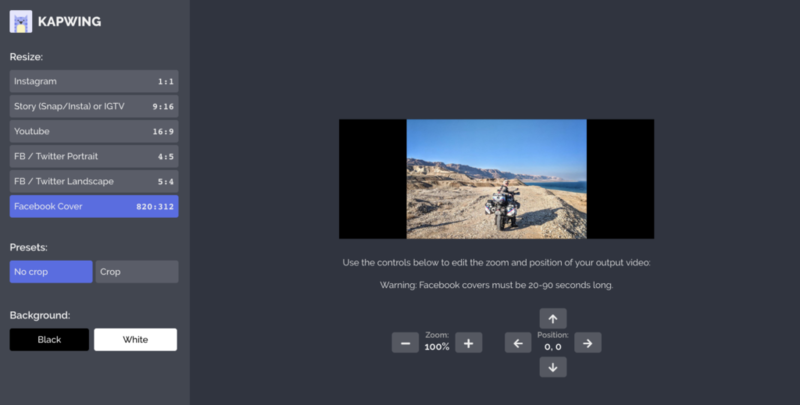 From this screen, upload your video or image, either from a file or URL. 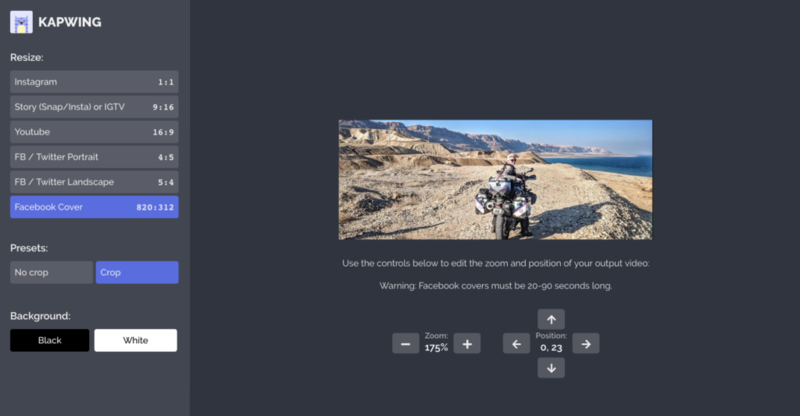 Kapwing supports photos, videos, and GIFs. 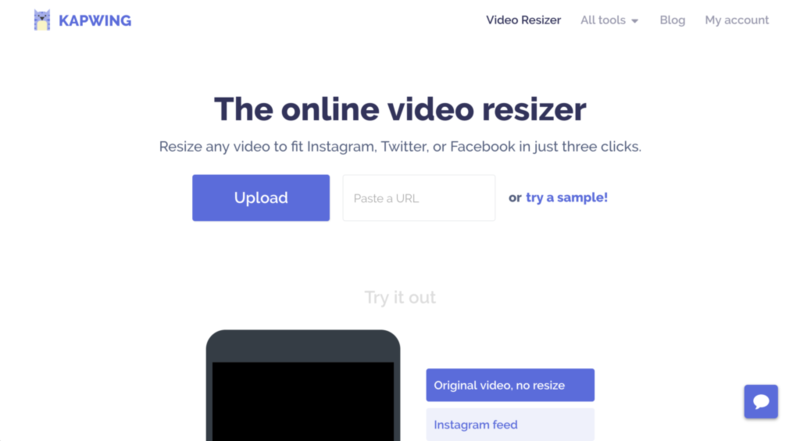 If you want to just experiment with how the Kapwing video resizing tool works, click on “Try a Sample!” and you can experiment with a stock video. Once your image or video is uploaded, you will be taken to the editing screen. We’re making a Facebook Cover image, so in the left-hand column of the editing screen, click the icon that reads Facebook Cover, 820:312. The demo of the image immediately resizes to 820:312. Kapwing defaults to “No Crop,” meaning that black padding will appear in the area around the original photo or video. You can change the background from black to white, if you wish. To make the background padding go away, click the Crop option on the left, under “Presets.” The preview will automatically be resized to fill the 820:312 landscape. You may find that this cropping eliminates important parts of the photo or video. Don’t worry: nothing has been permanently removed from your image, and you can easily move the subjects back into view. Below the image preview, you will find four arrows to toggle the position. If heads are cut off, click the down arrow until the desired detail comes into view. If subtitles are cut off, click the up arrow to shift the image up. Consider that your profile picture covers up the bottom left area of the image, so you might want to move important subjects away from that space. Also, when people view your Facebook cover in the mobile app, the left and right edges will be cut off; the media appears a bit narrower. So, you don’t want crucial subjects to appear at the far sides of the picture. If you uploaded a video, a demo will play on a continuous loop, so you can confirm that everything is where you want it to be. You can also zoom in and out of the photo or video, using the plus (+) and minus (-) zoom buttons below and to the left of the demo. The preview will continue to reflect the changes as you make them. Facebook Cover videos must be between 20 and 60 seconds long. If you uploaded a video, you can adjust the length of the video from inside the Kapwing Resizer. To do this, click on Trim Video above and to the left of the video preview. You can use the white sliders or type in a specific timestamp to change the start and end the video. To start the video later, drag the left-hand marker closer to the center of the purple bar. To end the video earlier, drag the right-hand marker to the center. When your video has the desired starting and stopping points, click the red Done Trimming button to return to the main resizing screen. When you are back in the main video-resizing screen and the image is to your liking, click on the red “CREATE” button in the bottom left-hand corner of the screen. You will be taken to a download screen where you can save the image directly, or go back and edit some more. Once you have your resized media, you can upload it to Facebook for a new cover! Kapwing is free to use, but in the free version there’s a small watermark in the bottom corner. You can remove the Kapwing branding for a small fee or you subscribe for unlimited no-watermark access to all of Kapwing’s photo and video editing features.